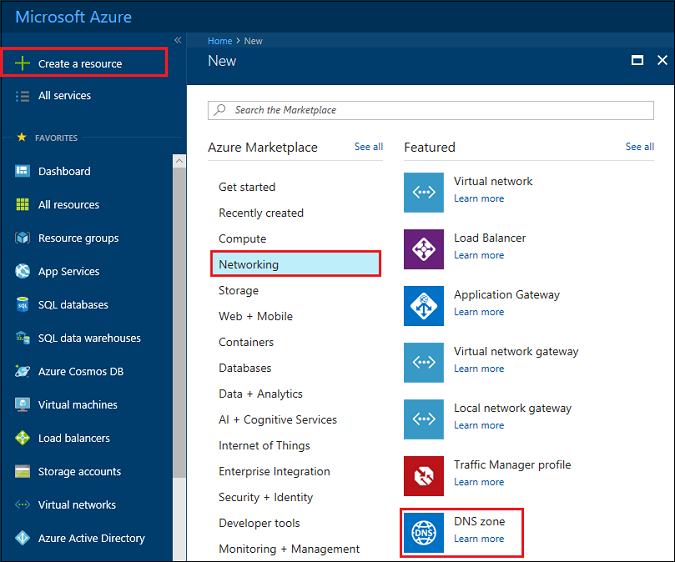 This article shows you how to manage your DNS zones by using the Azure portal. You can also manage your DNS zones using the cross-platform Azure CLI or the Azure PowerShell. On the Hub menu, navigate to Create a resource > Networking > DNS zone to open the Create DNS zone blade. Subscription [Your subscription] Select a subscription to create the DNS zone in. Resource group Create new: contosoDNSRG Create a resource group. The resource group name must be unique within the subscription you selected. To learn more about resource groups, read the Resource Manager overview article. The resource group refers to the location of the resource group, and has no impact on the DNS zone. The DNS zone location is always "global", and is not shown. In the Azure portal, navigate to More services > Networking > DNS zones. Each DNS zone is its own resource, and information such as number of record-sets and name servers are viewable from this view. The column NAME SERVERS is not in the default view. To add it, click Columns, select Name servers, and then click Done. Navigate to a DNS zone in the portal. On the DNS zone blade, click Delete zone. You are then prompted to confirm you are wanting to delete the DNS zone. Deleting a DNS zone also deletes all records that are contained in the zone. Learn how to work with your DNS Zone and records by visiting Get started with Azure DNS using the Azure portal.